Sonia Gandhi, the longest serving president of INC will make way for the next president of the party formed by British civil servant Allan Octavian Hume in 1885. 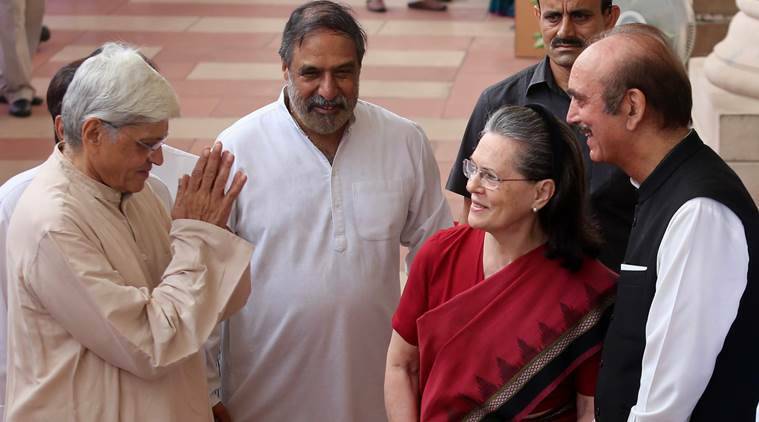 Congress leaders Sonia Gandhi, Ghulam Nabi Azad and Anand Sharma during the VP Election at the Parliament house. Express photo by Prem Nath Pandey. The Indian National Congress is all set to welcome its new president, nearly two decades after Sonia Gandhi was elected to the post. Sonia Gandhi’s son Rahul Gandhi is expected to be elected unopposed as the nomination process drew to a close. In the party formed by British civil servant Allan Octavian Hume in 1885, Sonia Gandhi is the longest-serving president of INC. In its initial days, the party was not formed to demand independence from British rule. It was rather set up to bring together a group of educated individuals on a common platform to influence policymaking. Lord Dufferin was the Viceroy of British India when party was formed. The first conference of representatives was convened on December 25, 1885, by the Union of Pune (Maharashtra) but the meeting was later decided to be held in Bombay. The meeting took place from December 28-31 in Bombay’s Gokuldas Tejpal Sanskrit College. Womesh Chandra Bonnerjee was the president of the first session of the Indian National Congress. A total 72 delegates from all parts of the country took part in the session. 1885, 1892: W.C. Bonnerjee was the President of the 1885 session in Bombay. He was the first president of the Indian National Congress. Bonnerjee was also the president of INC’s Allahabad session in 1892. 1886, 1893: Dadabhai Naoroji was the president of the Calcutta conference in 1886. The Lahore session in 1893 was also held under his presidentship. He was a Parsi intellectual, educator, cotton trader and social reformer renowned as the Grand Old Man of India. 1887: Badruddin Tyabji was the president at the Madras conference in 1887. 1888: George Yule became the first British president of INC and presided over the Allahabad session in 1888. 1889, 1910: William Wedderburn was the president at the Bombay session in 1889 and the Allahabad conference in 1910. 1890: Pherozeshah Mehta was the president of INC’s Calcutta session in 1890. He was a leading lawyer in the Bombay presidency and was knighted by the British government for his service. 1891: Anandacharlu presided over the Nagpur session in 1891. 1894: Alfred Webb was the president at the 1894 Madras conference. 1895, 1892: Surendranath Banerjee was the president of INC’s Poona session in 1895 and the Ahmedabad conference in 1902. He was called the sobriquet Rashtraguru. 1896: Rahimtulla M Sayani was the president at the Calcutta session in 1896. One of the founding members of INC, he was the second Muslim to become its president. He was a follower of Aga Khan and was from the Khoja community. 1897: C. Sankaran Nair was the president at Amraoti conference of INC in 1897. Till date, he is the only Keralite to have held the position. A lawyer, jurist and activist by profession, he had slammed the highhandedness of the foreign administration and called for self-governance. 1898: Anandamohan Bose, a barrister by profession, was the president at the Madras conference in 1898. 1899: Romesh Chunder Dutt presided over the Lucknow conference in 1899. He was a civil servant, writer, translator of Mahabharata and Ramayana, and an economic historian. 1900: Sir Narayan Ganesh Chandavarkar was the president of the Lahore session of INC in 1900. He was then one of the leading Hindu reformers in western India. He was also on the bench of the Bombay High Court and was knighted in 1910. 1901: Dinshaw Edulji Wacha, one of the founding members of INC, was president at the 1901 Calcutta session of INC.
1903: Lalmohan Ghosh presided over the 1903 conference of INC in Madras. He was a leading Bengali barrister. 1904: Henry John Stedman Cotton was the president at the 1904 conference at Bombay. He was a long-serving Indian civil servant and was sympathetic to the sentiments of Indian nationalists. 1905: Gopal Krishna Gokhale presided over the Benares conference in 1905. He went on to lead the moderate group (naram dal) after the party split into garam dal and naram dal. After Mahatma Gandhi’s return to India, he joined Gokhale’s group to lead the independence movement. 1907, 1908: Rashbihari Ghosh was the president of INC’s Surat conference in 1907 and the Madras session of 1908. He was a politician, lawyer, social activist and philanthropist. He was one of the most vocal opponents of radicalism or extremism and was part of the moderates. 1909, 1918: Pandit Madan Mohan Malaviya was the president of INC’s 1909 conference in Lahore and the 1918 conference in Delhi. He is credited with founding the Benares Hindu University, Asia’s largest residential university. An educationist by profession, he was conferred with the title mahamana by Rabindranath Tagore and was also posthumously conferred with the Bharat Ratna. 1911: Bishan Narayan Dar presided over the Calcutta session in 1911. 1912: Rao Bahadur Raghunath Narasinha Mudholkar was the president at the Bankipore session of INC in 1912. He was a staunch advocate of female education, widow remarriage abolition of untouchability. He was also Companion (CIE) of the Most Eminent Order of the Indian Empire, an order of chivalry founded by Queen Victoria in 1878. 1913; Nawab Syed Muhammad Bahadur was the president at INC’s Karachi session in 1913. Born into one of the wealthiest families in south India, he was also the first Muslim sheriff of Madras. 1914: Bhupendra Nath Bose was the president at the 1914 session of INC in Madras. He was also the first president of Mohun Bagan AC. 1915: Lord Satyendra Prasanna Sinha, the first baron of Raipur, was the president of the Bombay conference in 1915. He was later knighted and became the first Indian to be a member of the British House of Lords. Sinha’s ennoblement also helped to move a bill that eventually became the Government of India Act 1919. 1916: Ambica Charan Mazumdar was the president at INC’s Lucknow session in 1916. The historic Lucknow Pact between the INC and Muslim League was signed during this session. It was also the session where the Congress’ moderate and extremist groups reunited. 1917: Annie Besant presided over the 1917 session in Calcutta and became the first woman president of INC. Besant was a sociologist, theosophist, social reformer and an advocate of Indian self-rule. 1918: Syed Hasan Imam presided over the Special Session of 1918 in Bombay. The session was convened to deliberate the contentious Montagu–Chelmsford Reforms Scheme. He was also a leader of the Khilafat movement. 1919: Motilal Nehru presided over the Amritsar session of INC in 1919 as well the Kolkata session of 1928. Motilal Nehru was an eminent lawyer and is the founder patriarch of the Nehru-Gandhi family. The second session presided by him witnessed a tussle between two sections of the party –one which accepted dominion status and the other which wanted complete independence. He was also part of the civil disobedience movement, non-cooperation movement, and the Swaraj party. Though close to Mahatma Gandhi, he was often critical of him. 1920: Lala Lajpat Rai presided over the Calcutta session in 1920. He was regarded as Punjab Kesari. A freedom fighter, he also controversially asked for India to be divided into a Hindu and Muslim state in 1923. He was also a leader of several Hindu reform movements, including the Arya Samaj. 1920: C. Vijayaraghavachariar presided over the Special Session at Nagpur in 1920. He was an orthodox vaishnavite who was accused of inciting religious riots, but was cleared later. He was close to AO Hume and played a key role in the formation of the Swaraj Constitution. He was also part of the Propaganda Committee of Congress. 1921: Hakim Ajmal Khan presided over the 1921 session in Ahmedabad. He was one of the founders of Delhi’s Jamia Millia Islamia University and the Ayurvedic and Unani Tibbia (medical) College. He is the only person to have been appointed president of the Indian National Congress, the Muslim League and the All India Khilafat Committee. 1922: Deshbandhu Chittaranjan Das presided over the Gaya conference of INC in 1922. A lawyer by profession, he was a leading member of the Indian National Movement and a founding leader of the Swaraj Party in Bengal. 1923: Mohammad Ali Jouhar was the president at the Kakinada session of INC in 1923. 1923, 1940-46: Abul Kalam Azad presided over the Delhi Special Session in 1923. He was also elected presided of the 1940 session in Ramgarh. Commonly regarded as Maulana Azad, the leader was conferred Bharat Ratna posthumously. He was a revolutionary poet, journalist, activist and freedom fighter. He is credited for the formation of University Grants Commission and the Indian Institutes of Technology. He oversaw the formation of a national education system which offered free education till primary school. 1924: Mohandas Karamchand Gandhi was the president of INC’s Belgaum session in 1924. Gandhi spearheaded several movements like the non-violent civil disobedience, non-cooperation, swadesi movement etc. Gandhi is one of the most important members of the Indian nationalist movement solely on the basis of influence and mass support gathered by his vision of non-violence, religious pluralism, swaraj and a upliftment of the downtrodden. 1925: Sarojini Naidu presided over the 1925 session in Kanpur. 1926: S Srinivasa Iyengar was the president at the Gauhati session of Congress in 1926. An eminent lawyer, he served as the Advocate-General of Madras Presidency from 1916-1920. 1927: Mukhtar Ahmed Ansari presided over the Madras session in 1927. He also served as the president of the Muslim League and was one of the founders of Jamia Millia Islamia University. He was chancellor from 1928-36. 1929, 1930, 1936, 1937, 1946 (July-Sep), 1951-1954: Jawaharlal Nehru presided over the Lahore session in 1929 as well as the Karachi session of 1930. He also presided over the 1936 sessions in Lucknow and the 1937 session in Faizpur. He presided over the Delhi sessions in 1951 and 1952 as well as the Hyderabad and Calcutta sessions in 1953 and 1954. Jawaharlal Nehru wasn’t elected president in 1929 but was backed by the influential Motilal Nehru. However, he was one of the central figures of Indian politics and Independence movement. The first prime minister of independent India was a trained barrister and was mentored by Gandhi. He is regarded as Pandit Nehru due to roots his in the Kashmiri Pandit community. 1931: Sardar Vallabhbhai Patel was president of the Karachi session in 1931. The conference endorsed the Gandhi-Irwin Pact under his presidentship at this session. Patel was one of the leading figures of Indian independence movement and is credited with persuading hundreds of provinces to form India. 1933: Nellie Sengupta presided over the Calcutta session in 1933. 1934, 1935: Rajendra Pasad was the president of the INC of Bombay conference in 1934 and the Lucknow session in 1935. Rajendra Prasad also went on to become the first president of independent India. 1938, 1939: Subhas Chandra Bose was the president of the Haripura session of Congress. He was elected the president for the Jabalpur session in 1939 but had to resign. He was replaced by Rajendra Prasad. Bose founded the Indian National Army (INA) and was opposed to the pacifist movement adopted by INC. His movement aimed at liberating India by the all Indian army INA. He is one of most renowned freedom fighters in India’s history. 1947: J.B. Kripalani presided over the Meerut session in 1947. He was one of the most ardent disciples of Mahatma Gandhi and was president of INC during transfer of power from Britain to India in 1947. 1948, 1949: Pattabhi Sitaraimayya was the president of INC in 1948 and 1949, and presided over the Jaipur conference. He was a staunch advocate of provinces divided on linguistic lines. 1950: Purushottam Das Tandon was president in 1950 and presided over the Nasik session. He was one of the leading figures that demanded official language status for Hindi. 1955-1959: U. N. Dhebar was president of INC from 1955-1959. During his time, he presided over the sessions in Avadi, Amritsar, Indore, Gauhati and Nagpur. 1959, 1978-84: Indira Gandhi was mentored by her father Jawaharlal Nehru and learnt the nuances of party politics and governance by working as his aide for several years. She was elected as president in 1959 and presided over the Delhi special session. She was re-elected as president after the split in Congress in 1978 and, barring a brief gap, served till her assassination in 1984. She gained notoriety for several issues like imposition of emergency, war with Pakistan, gagging of press, raid of Golden Temple etc. She is also renowned as one of India’s strongest and most decisive prime ministers. 1960-1963: Neelam Sanjiva Reddy was president of INC from 1960-1963 presiding over the Bangalore, Bhavnagar and Patna sessions. He also went on to become the sixth president of India. 1964-1967: K. Kamaraj was president of INC from 1964 to 1967 presiding over Bhubaneswar, Durgapur and Jaipur sessions. He was regarded as the kingmaker in Indian politics. He played an important role in the elevation of Lal Bahadur Shastri as India’s prime minister after Jawaharlal Nehru’s death. 1968, 1969: S. Nijalingappa was INC’s president in 1968-69. He was a key member of the Indian independence movement as well as the unification of Karnataka. 1970, 1971: Jagjivan Ram was president in 1970-71. Commonly regarded as Babuji, he was a leader for the backward classes, untouchables and exploited labour. He pushed for social justice to be enshrined in the constitution and was the youngest minister in Nehru’s interim government in 1946. 1972-74: Shankar Dayal Sharma served as president of INC for four years. He went on to become the ninth president of India. He is also the recipient of Living Legends of Law Award of Recognition by the International Bar Association. 1975-77: Devakanta Barua served as Congress president during emergency from 1975-1977. He had once famously said: “India is Indira. Indira is India.” However, he later left Indira’s side and joined Congress (Urs), which was later rechristened Indian Congress (Socialist). 1985-1991: Rajiv Gandhi succeeded his mother Indira Gandhi to the position of INC president in 1985 and served until the time he was assassinated in 1991. He became the youngest prime minister of India when he was elected to the post at age of 40. His tenure was mired in controversies like the Bhopal gas tragedy, Shah Bano case, Bofors scam, which led to Congress’ defeat in 1989. He also blocked the coup in Maldives, antagonised groups like PLOTE, sent peace corps to Sri Lanka in 1987 which resulted in direct conflict with the Liberation Tigers of Tamil Eelam (LTTE). He was the younger brother of Congress leader Sanjay Gandhi and husband to Sonia Gandhi. 1992-96: PV Narsimha Rao was president of Congress from 1992 to 1996. He was the first prime minister from southern India and, under his tenure, he oversaw the liberalisation of India’s economy. 1996-1998: Sitaram Kesri was elected president and served from 1996-1998. His was one of the most controversial exits from the party. 1998-2017: Sonia Gandhi, Italian by descent, married Rajiv Gandhi to come into the Nehru-Gandhi family. She is the longest-serving president of the party till date. She joined the party as a primary member at the 1997 plenary session and was elected president in 1998. She took over the reins of the party seven years after her husband was assassinated and has held office since then. Under her tenure, she began by suffering defeat at the hands of the BJP. However, she led the party to two consecutive victories during general elections in 2004 and 2009.